Melissa ErricoLast month I had the pleasure of going to see Melissa Errico's concert Sing The Silence at Joe's Pub which focused Melissa's journey of getting to sing again after she suddenly lost her voice during the run of Classic Stage Company's production of Passion. Melissa had to withdraw from that production and be on complete vocal rest for 100 days, meaning no singing and no talking whatsoever! Well, the days of Melissa Errico being silent are very over! She is back and better than ever! I was amazed at how powerful her voice was. She belted stronger and louder than she ever has! I asked her after the show if she felt her voice was stronger than before she lost it and she said, "Yes, absolutely." 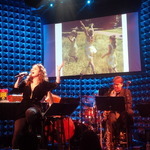 Melissa Errico in "Sing The Silence" at Joe's Pub in NYCWhile the focus of the show was on her 100 days of silence, it was actually more of a biopic piece chronicling her life. She started off the show with some family background moving towards her birth then to her childhood, Broadway, and ultimately losing her voice. Melissa's journey was heavily influenced by her grandmother and great-grandmother as well as her mom's aspirations to be a singer. Some might say, she was destined for the stage. There was a lot I could identify with in Melissa's show, especially her time growing up on Long Island and having Broadway just a car or train ride away. I learned a lot about Melissa's life and her desire to be a performer. She worked hard at it and did whatever it took to get to where she wanted to be. She was going strong and then bam, without warning, one night on stage, she lost her voice. The emotional journey from there to getting her voice back was quite a long road. It was frightening at times to think Melissa Errico would never sing again, but thankfully, that was not the case! Melissa's voice is back, stronger than before! Melissa Errico in "Sing The Silence" at Joe's Pub in NYCMy favorite musical moments in the show were "How Lovely To Be A Woman" from Bye Bye Birdie, "The Colors of My Life" from Barnum, "People's Parties" by Joni Mitchell, "This Woman's Work" by Kate Bush, "Happiness" from Passion, "Sing The Silence" by Adam Gopnik and Scott Frankel, "Silent Partner" by Patricia Barber, and "Blackbird" by The Beatles. Melissa sounded great throughout the whole show, but these were the songs that have really stuck with me and the ones I felt really drove the story of her journey home! It did take quite a while to get to the point where Melissa lost her voice and as this piece moves forwards in development, I hope she will re-examine it to see how she can get to that point quicker. I loved learning about her family history and her childhood, but I think that is most of what could be more condensed. As a fan of hers, I want learn about what got her to where she is today, but I want more of the Broadway chatter and then getting to the actual part that made headlines for days when Melissa lost her voice. I think with those cuts, the show would be tighter, stronger, and move more seamlessly. Melissa Errico in "Sing The Silence" at Joe's Pub in NYCI am thrilled Melissa is no longer "singing the silence" and that everyone can once again hear her powerfully soulful voice! I can't wait to see what is next for Melissa and the growth of Sing The Silence because Melissa will be silent no more! If you missed my interview with Melissa about this show, click here to read it!